“I write recipes that anyone can make,” said Faith Heller Willinger. 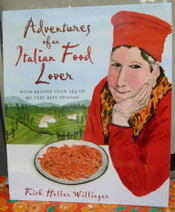 It was a relief to hear this, because I had just bought her latest book, “Adventures of an Italian Food Lover” (Clarkson Potter 2007; $32.50). And I detest recipes that that involve impossibly complex procedures and long lists of obscure, unaffordable ingredients. Willinger was in Los Angeles for a few days to promote the book. 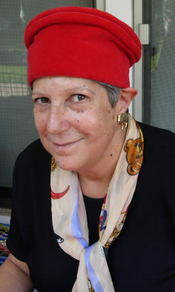 She is married to an Italian and has lived in Italy for 35 years. Scanning the recipes, I found many I would try, including a spaghetti dish that calls for only five ingredients, two of which are salt and pepper. I could see that Willinger meant what she said. The book is subtitled “With Recipes from 254 of My Very Best Friends.” Willinger’s friends are chefs and restaurant owners, innkeepers, wine and grappa makers, tableware designers, a butcher, artisanal food producers and farmers. Along with the recipes, she tells what and where to eat in the regions into which the book is divided: northern and central Italy, Tuscany, southern Italy and the islands. The nicely done watercolor illustrations are by Willinger’s sister, Suzanne Heller, who lives near her in Florence. The recipes are practical and clearly written. Willinger allows reasonable substitutions when a key ingredient is not available. For example, if you don’t have expensive, aged balsamic vinegar, you can boil regular balsamic with sugar until reduced and syrupy. Sometimes valuable tips are embedded in the stories rather than in the recipes. Cesare Benelli, chef/owner of Al Covo in Venice, explains that to make great risotto, one should cook the rice in extra virgin olive oil over high heat until it makes whistling sounds, then add wine to “shock” the mixture and then broth. That advice accompanies a recipe for pear cake with grappa sauce, not risotto. Recipes that tempt me include leek and sausage orzotto, which is risotto based on barley rather than rice; spaghetti with a spicy onion and tomato sauce, and lamb with an ancient Roman-inspired marinade that i ncludes wine, orange juice, honey and cumin—simple to make, but sumptuous. . I did try sweet and sour chicken bites from Valeria Piccini who, with her husband, Maurizio Menichetti, owns Da Caino restaurant in southern Tuscany. Although the bites are suggested as an appetizer, I served them as a main dish. My verdict: Easy, fast and delicious, like so much of Willinger’s food. Cut the chicken thighs into bite-size pieces. Mince the garlic, sage and rosemary together, and combine with the salt and pepper. 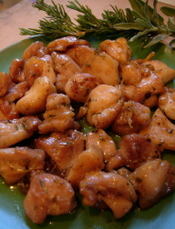 Mix the chicken pieces with the herb mixture, cover, and marinate in the refrigerator for 2 hours or more. Combine the honey and vinegar in a small saucepan and melt over low heat, stirring to combine. (You can also heat them in a microwave and stir to combine.). Set aside. Heat the olive oil in a medium nonstick skillet, add the chicken pieces, and sauté over high heat to brown lightly. Add the white wine, and when it’s evaporated, add the vinegar-honey mixture. Cook over highest heat to evaporate the liquid, until the sauce is shiny and coats the chicken pieces. Season with additional salt and pepper, if necessary. Serve with toothpicks as an appetizer. I had heard about the extraordinary pasta made in Italy by Vincenzo Spinosi, who employs such artisanal techniques as hand-breaking fresh eggs into the dough. Production is small, and the pasta is expensive—about 12 times what I pay for supermarket pasta on special. And it’s almost impossible to find in Los Angeles. Then the other day I walked into Market Gourmet in Venice and found not only Spinosi pasta but Vincenzo Spinosi himself, visiting from his home in the Marche region of Italy. 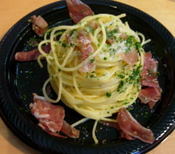 Even better, he was demonstrating how to cook his signature dish, pasta with prosciutto and lemon. 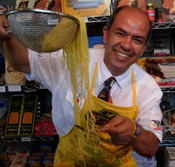 As a small group of Italian food enthusiasts watched, Spinosi slid long strands of fine golden pasta into a bubbling pot to cook for a couple of minutes. Although dry, this pasta cooks rapidly—four minutes at the most, and Spinosi held up four fingers to make that clear to those who did not speak Italian. Then he lifted the pasta into a skillet and tossed it gently with prosciutto, finely grated lemon zest, parsley and Parmesan cheese in a light sauce of olive oil, white wine and pasta cooking liquid. The texture of the pasta was amazing—tender, yet firm and springy. The rich golden color made it even more appetizing. And there was just enough seasoning to add subtle flavor, but not to overpower the pasta, which would have been delicious with no sauce at all. Could I make this? Although Italian food isn’t my specialty, I was determined to try. I have lemons and Italian parsley in my garden, and I had bought a package of the pasta that Spinosi used, which was Spinosini 2000. What sets Spinosini apart from other Spinosi pastas is that it is made with Livorno eggs that are endowed with omega-3 fatty acids. I had a good brand of Italian extra-virgin olive oil on hand, a Santa Barbara Chardonnay that I had just opened, a fresh package of prosciutto, and the best cheese I could find—Red Cow Parmigiano-Reggiano, which is as rare here as Spinosi pasta. The milk for this cheese actually comes from red cows (more likely reddish brown), thus the name. It is easiest to make a dish right after a demonstration, as if the skills of the chef are temporarily imprinted on the brain. So I set to work immediately and produced a fine version of Spinosi’s pasta. Simple and elegant, it deserves to be a main course. I would add only an antipasto platter or a mixed salad and an Italian red wine such as the one I bought, Barbera d’Alba 2000 from Azienda Vinicola Dosio. The next day, I committed culinary sacrilege by reheating a small amount of leftover pasta in the microwave. This revealed how exceptional it is. Not even such harsh treatment could damage the firm, resilient texture. Next time, though, I’ll invite friends. Anything this good ought to be shared. And for sure there won’t be any leftovers. Spinosi pastas and Red Cow Parmigiano-Reggiano cheese are carried at Market Gourmet, 1800 A Abbot Kinney Blvd., Venice, CA., 90291-4841. Tel; (310) 305-9800. 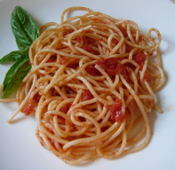 The pastas and cheese are imported by Guidi Marcello Ltd. in Santa Monica. Heat the oil in a deep skillet over medium heat. Meanwhile, bring a large pot of salted water to a boil. Add the prosciutto to the skillet and cook until heated through but not browned and crisp. Add the wine and keep warm. When the water boils, drop in the pasta. Cook 2 minutes. (If using another brand of pasta, follow the manufacturer's cooking instructions). Lift out the pasta and place in the skillet with the prosciutto. Measure 1 cup pasta cooking liquid. Add ½ cup to the skillet, stir gently and cook 1 minute. Add the lemon zest, cheese and parsley. Toss gently and cook 1 minute longer. If the pasta seems dry, add more of the pasta cooking liquid and a dash of olive oil. Divide between two heated plates. Garnish each serving with additional cheese and parsley leaves. Makes 2 main dish servings or 4 appetizer servings.